Well this is quite a sad post to write. After all that build up and excitement, I am officially declaring the Tom Ford Eye Defining Pen a "good product". Yep, good. Not great and not holy grail. How disappointing and middle-of-the-road is that? If I was to describe the experience in using it I would say: it works well, delivers a deep black product and possesses brushes that allow you to create a precise defining line. * It is weighted, a factor that sub-consciously makes you think "quality/expensive", and a design decision that helps create stability when you are actually using it to line. * The decision to have both a calligraphy style and more precise end is genius. The calligraphy brush covers the surface area and helps create elegant wings while the more precise end can aid sharpening of lines and inner corner work. * It is a true black and remains so after hours of wear. There is little to no fading even hours after application. * The finish - this is a glossy liner. It will dry with a shine to it. I don't mind that per se but the issue I have is that this type of finish impacts application. It's hard to describe but when lining my eyes it almost feels like I am applying a cream over a cream, as if the liner is too glossy to set. 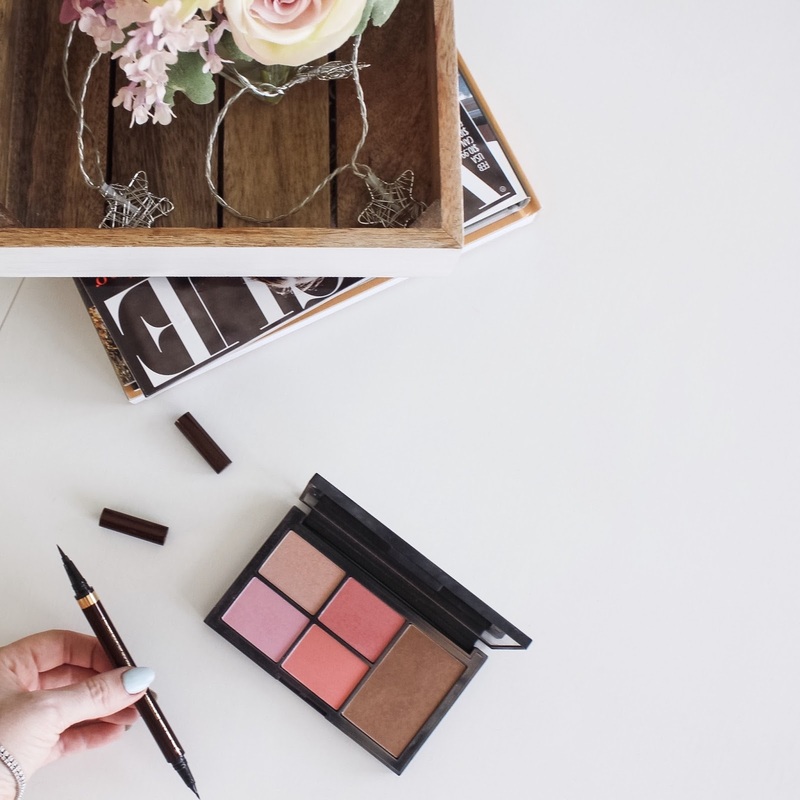 * The pigmentation is good but compare it to Clarins Intense Black Liner though and it falls a bit flat - the latter is a deep colour right off the bat and offers no risk of disappointment. * The price. Yeah, it's expensive and it's because Tom Ford is not going to discount his brand by offering a liner that runs in the same cost bracket as the rest of the department store brands. When the RRP is so high though you inevitably start thinking about whether it is better than anything else. Clarins and Kat Von D's Tattoo Liners may lack the sophisticated packaging and the 2-nib offering but they last just as long, are just as functional and, it has to be said, are half the price. So, in conclusion, it's undeniably good but if you are currently making do with the likes of L'oreal Super Liner and you just cannot justify a Tom Ford-level expense for one product then be reassured that you are not missing out on the experience of a lifetime. That's my two cents anyway :) Thanks for reading! Loved this honest, in-depth review. Sometimes it's hard to see past the company name and the packaging (not to mention the price) and judge the product based on what it is, so often we want to love something right away. Lots of people are interest to makeup their face. Many of take much care in their eyes. But many people struggling in eye problem due to lots of environmental issues. But this problem is easily cured by using the medicine Bimatoprost online. It gives relief from eye problem. this is why i love your blog. you purchased a product with your own money and gave an honest review. Try the Surratt Beauty one next! It is a very black black and it lasts forever. I used to go through 2 or 3 of the Stila liners for the one Surratt one. It's funny you say that as I have been eyeing that brand up for a while but have never been sure what to buy. Do you have any other must haves? Good to know! I'll save my money then. However I am very faithful to the Asian brands when it comes to black liners. They are cheap, last ages and are good to handle. So I will be stocking up in Tokyo/Seoul in two week on holiday. Together with tons of other skincare products that I absolutely don't need as I have a whole drawer at home. But I already know I won't be able to resist pricing and the cuteness of some of it! Kat Von D is amazing! I love the one she has in the navy blue - incredible! Oh eyeliners... this is something I have a lot of experience with. Right now (and for the last several years ) my go-to technique is this: I use a pen variety of eyeliner to make an "outline" and to get the point razor sharp. Then I fill in with Mac Black Track with a Real Techniques eyeliner ( the one with the plastic nib ). I used to use different brushes with the Black Track but nothing is as sharp and clean as a pen-type liner. ( Current brand: Stila ). I can't however do a good job filling in with the pen liner. ( Apparently I failed that portion of kindergarten.) So the bottom line is I'm paying as much for my combo eyeliner as this Tom Ford. It's dual nibs might give me the control I want so on the surface it seems like it would be worth a shot. I think with Tom Ford you're really paying for the name and packaging. Which is totally fine if you want to! Personally I already have a few eyeliners I prefer so even though I'm constantly tempted by what's new, I always tend to go back to my HGs anyway. Have you tried the Estee Lauder double ended liner? Same idea as the Tom Ford but slightly less fancy packaging. I find it easy to apply and it lasts ages on my lids! the KVD doesn't even make it to lunch time on my oily eye lids and it fades to a gross dark grey :( I will have to try out the clarins! Writing about good products is so dissatisfying. A rave - yes, please! Tearing something apart - anytime. But "good"? A bloggers nightmare. Have you tried the Estee Lauder - Little Black Liner? Maybe slightly cheaper but has the double point and a very strong black liner that isn't not overly glossy! I've always been so happy with L'oreal Super Liner that I've not tried many others. And, I know what you mean about a liner being too glossy, I remember L'oreal did a version like this! Please be sure to utilize this application at Quick Shortcut Maker APK Download Play Store. If you are a new user. Kingroot apk: it is offered as android and pc variation http://kingrootapkdownloads.com Windows application which requires your gadget to be attached to PC through USB Cable. For the eyes it is the best method to touch all the eyes protection and maintain all the terms, If you want any type of eyes drop you can touch GenericViagraSafe. The reason behind calling guaranteed payday loans online lending, the ‘new age lending’ is its liberal approach. People avail funds despite bad credit scores and unemployment. When you have this instant payday loans chance, you should use it. Nice post.Eyes are the most important part of our body and so its important to take special care of them. Interesting blog, keep it up! Eyes are very essential part of our face. So, people are taking care of their eyes. Eyelashes are important to make eyes very attractive. Make eyelashes stronger by using online bimatoprost eye drop. This drop helps to treat different eye issues like glaucoma or making the growth of eyelashes. Also, improves the number of fluids in the user’s eyes. Website Designing and Development company in Delhi.